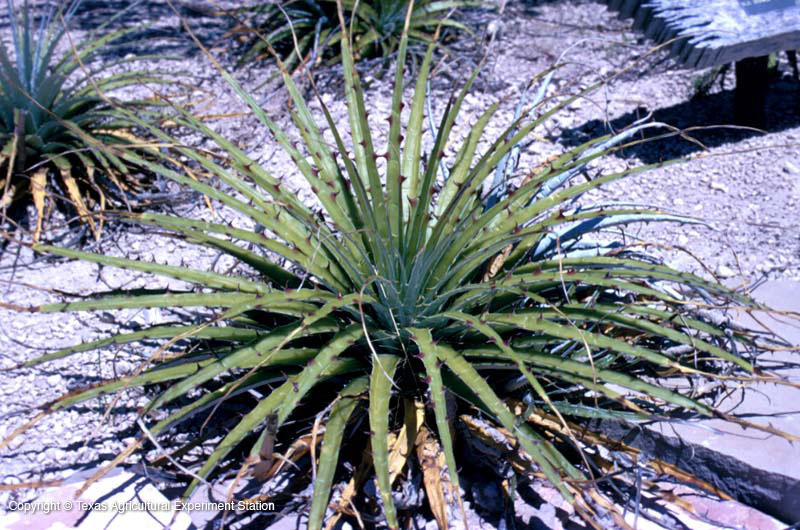 Texas false agave is a member of the pineapple family that resembles an Agave lechuguilla with vicious teeth on the leaf margins. The leaves are in dense basal rosettes and are usually recurving (curved backwards) and covered with small scales on the upper surface. They grow on rocky limestone mesas and slopes in the Trans-Pecos, often found with lechuguilla, and like them they form clusters up to 3 feet across. They can be distinguished from lechuguilla, however, by their leaves, which are scaley and lighter in color, and which turn reddish in the fall. In the spring a loose cluster of inconspicuous flowers occurs on 2 foot stalks. Texas false agave is known only from the Trans-Pecos and Northeast Mexico. As a cultivated plant, it can be treated much like an Agave, doing best in well-drained soil, full sun or light shade, with some supplemental moisture in summer droughts but dry roots in winter. It is reportedly cold hardy to 15 degrees F.